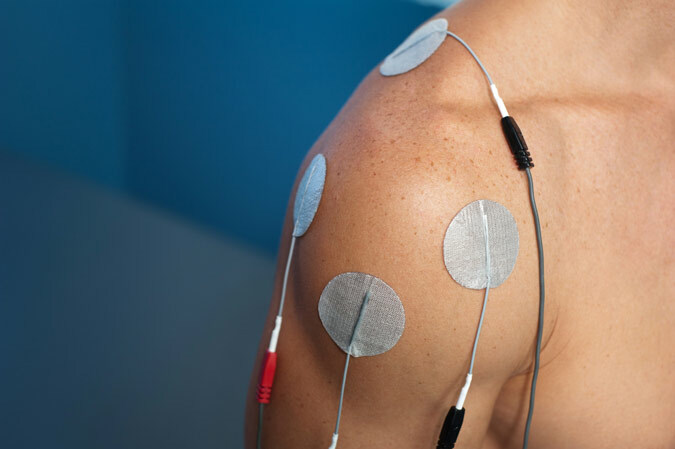 Electric muscle stimulation (also known as EMS or E-stim) uses an electrical current to cause muscles to contract. Electrotherapy is introduced into the body at the site of injury site through the use of electrodes. The therapist will then increase the intensity until a comfortable setting is reached with the patient. A main purpose of EMS is to speed up the recovery time of injured muscles. Interferential therapy is a different form of electrostimulation. This type of electrical stimulation therapy uses two or three distinctly different currents that are passed through a tissue from surface electrodes. Portions of each current are canceled by the other, resulting in the application of a different net current to the target tissue. Interferential therapy has been used on a wide range of patients, from professional athletes to children to help speed recovery times.